March 23-31, 2017, the Appalachian Community participated in “Say What? - Examining Freedom of Speech at App State,” a series of more than 30 campus events focused on freedom of speech and the First Amendment. 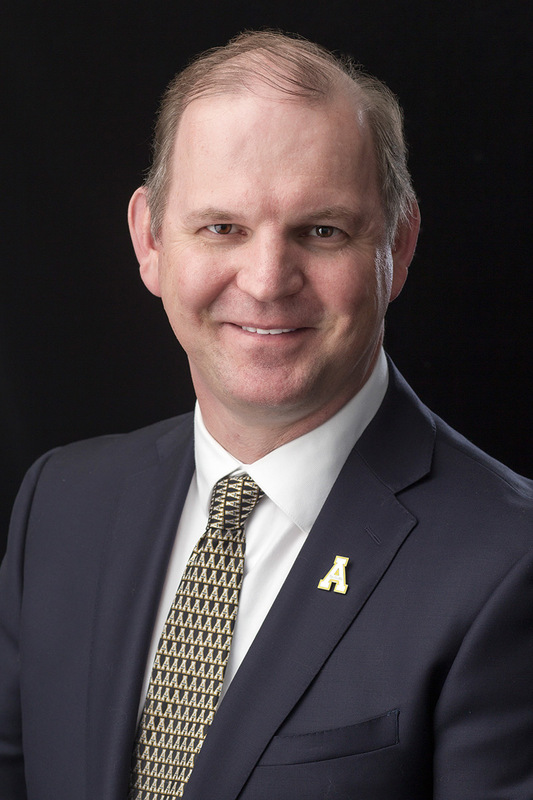 Here, Provost Kruger and his guest Leroy Wright talk about the importance of the workshops, small group discussions and public lectures scheduled around this topic and what the outcomes and next steps for Appalachian might be. Megan Hayes: Welcome to another Podcast with the Provost. We are here today with Provost, Darrell Kruger, who brought along Interim Vice Chancellor for Student Development, Leroy Wright to talk about a series of events that took place on our campus recently; discussing the First Amendment and freedom of expression on our campus. This discussion is not unique to Appalachian. College campuses across the country are having similar discussions about free speech, academic freedom, and respect for differences of opinion and belief. At Appalachian, the Chancellor’s office collaborated with divisions of Academic Affairs, Business Affairs, Student Development, and University Advancement to program about two dozen events, several of which were public, and some of which were workshops and small group interactions, to dig deep on this issues, and begin having some in-depth and sometimes complicated discussions about how a state institution, an institution of higher education, and in particular Appalachian can respect and adhere to the First Amendment of the Constitution while also fostering environments to discuss difficult topics that likely will elicit a variety of opinions and beliefs. We called the event “Say What? Examining freedom of speech at App State”. Our speakers included Dr. David Pilgrim, the founder of the Jim Crowe museum, Ken Wadike, a motivational speaker who has made it his mission to help people listen to one another during the most contentious of circumstances, Robert Shibley, executive director of the foundation of individual rights and education (or FIRE), as well as our own on campus experts including sustainability experts, and Dr. Nancy Love, whose research area is hate speech in music. Our week culminated with a visit from Dr. Lee Bird, Vice President of Student Affairs at Oklahoma State University-Stillwater, and an expert on student development and the first amendment rights of students. Additional information about the events that took place is diversity.appstate.edu/saywhat for anyone that might have missed an event or two. But now, we’re going to speak with Provost Kruger and Vice Chancellor Wright. Provost Kruger if I could, I would like to start with you, but if you would both please weigh in on this, can you talk about why it was important to do this on our campus? Provost Darryl Kruger: Certainly. Thanks for having us this afternoon. Higher education and the college experience is basically about stretching yourself, learning about other perspectives, and I think in our strategic plan we are fully committed to a transformational education experience for all of our students, and in the current political climate of the United States, in fact it’s even globally, I think it’s important that we create spaces and events of this nature where people can exchange ideas, and listen to other perspectives. So, I think that certainly first and foremost why we are doing it, and as you mentioned, it’s a good collaboration across divisions at the institution, and I think it was highly successful. The second reason is when we have speakers of the nature that you mentioned, these individuals are experts in their own right, and so they bring resources to us for both faculty, students, and staff. I think that’s an additional benefit of having speakers and seeing ourselves within the national landscape of course, because we are not unique, many campuses are dealing with the subject of what we’re speaking about this afternoon, so I think that’s an additional reason we are doing it. And I’ll share some other remarks about goals and what we took away from it, so thank you. MH: Vice Chancellor Wright, from a student development perspective, why was it important to bring these folks to our campus and have these discussions here? 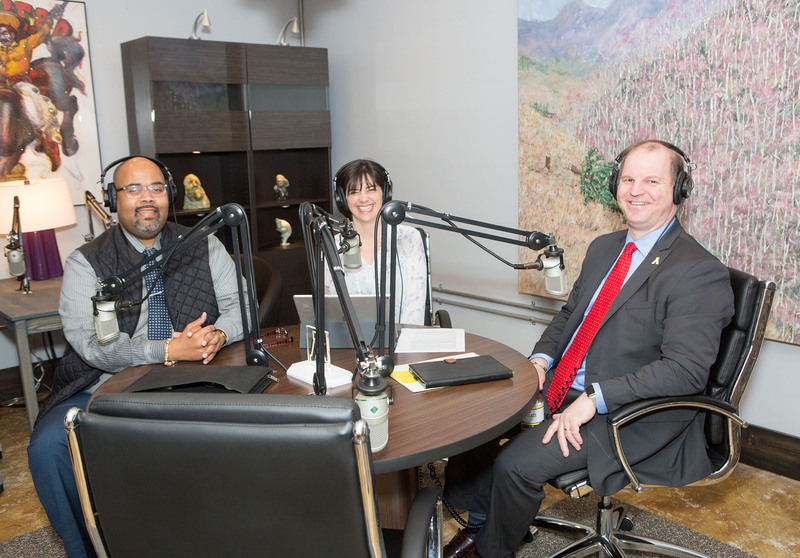 Vice Chancellor Leroy Wright: Sure, thank you Megan and Provost Kruger for inviting me to participate in today’s podcast. I think one of the biggest things is that, we’ve been navigating a variety of student-driven population kinds of issues where student activism is on the forefront of “What does it mean to be an Appalachian student?” and “What does it mean to navigate in the current landscape of our world right now?” And so, a lot of students in the past were wondering, “What is administration going to do to educate? What is administration going to do to help us navigate free speech?” It started with a chalking policy kinds of things, it started with privilege discussion kinds of things, and there’s just an ongoing need to figure out what is free speech? What is hate speech? And I think our campus community didn’t have a grasp on that solely, and so I thought it was important, in partnership with other divisions, to actually do what we are here to do and that’s to educate and inform students, while also engaging students in conversations about, what does it mean for hate speech, and what does it mean for free speech as a student and as a citizen? But then how do you have balanced conversations where individuals are okay to have different perspectives, its okay to believe different things, but how do you find that space where you can have dialogue and conversation around what’s important for you, and what’s important for the other person. So I think the spirit of “Say What?” is how do you say what? How do you engage in healthy dialogue around these sensitive issues where individuals are wanting to exercise free speech, they are wanting to understand how do you address hate speech? And I think bringing our current faculty and staff on board to help educate, where some of these individuals have been experts in their respective careers, having opportunities where students are not just hearing it from us, but they’re hearing it from experts, and so I think the connectivity of all of that is letting our student population know that there are a variety of schools nationally that are navigating the same thing, this is not Germaine to Appalachian State University. I attended our national student affairs annual conference, and the majority of the sessions were around civil discourse around student activism around free speech, and how do we educate, or how do we make sure that all perspectives are heard, and sometimes I think the level of sensitivity is a part of that where words are words and sometimes words hurt, but how do you have ongoing conversations around what it means to exercise your opinion. I think the spirit of this past week kind of encompassed that as well. MH: So, what kind of work did the speakers do with their students, faculty and staff? LW: You mentioned earlier, Megan, that there were public events and then there were also strategically planned meetings. One of them was around campus conversations, so there were conversations around “What is hate speech? What is free speech?” and I think having our government and justice faculty kick-off the speech summit by defining those terminologies, I think was important for our campus community to become more aware of what those things really mean from a constitutional perspective, from a legal perspective, and I think the goal of that was to set the foundation for what the rest of the week would involve. All the other speakers, in a sense, it was again a conversation with experts, so what is it that they can give our campus community, both faculty, staff, and students, as a way of preparing to continue the conversations. The summit was not meant to have just a one time conversation around free speech, but this is an opportunity to build a new tradition at Appalachian, and how do we have ongoing conversations, free speech as one topic, next spring maybe another topic that we may navigate, maybe it’s mental health, maybe its alcohol and other drugs, there’s a variety of issues impacting our student population, and this particular issue seems to be on the forefront of a lot of minds given our current political landscape that we’re navigating. So, bringing all of those individuals to campus helped set the stage or the framework for our students to be more engaged, our faculty and staff to more engaged, and also to remind people that we can sit down and have a conversation about free speech, hate speech, and not be offended, not to have daggers thrown at you, but to really engage in a health dialogue about what this means for our students as Mountaineers, or even faculty and staff working with our students. MH: So, Provost Kruger, from a faculty perspective and even a curriculum development perspective, what kind of work do the speakers do and what do you think our faculty in particular took away from these events? DK: Certainly, yeah. Give a shout out to Sue Edwards who really spearheaded this work with faculty. I think one of the things we’ve seen, and continue to observe, at least in the time that I’ve been at Appalachian, is students being concerned with campus climate, and particularly in the classroom when comments are made in the classroom, or assumptions are made about the identity of students, I think there’s been some concern around that. We’ve seen some of this with our bias incident report, and so in the conversations that we were involved in with the speakers, that was one sort of anchor in one area that we spoke about. Also, emphasizing the emphasis on diversity and inclusiveness and excellence. Because, sometimes when we have these conversations on campus sometimes the assumption can be exclusive, but I think seeing them all as intertwined I think is critically important. With respect to the classroom in particular, I think the speakers that we interacted with were able to work with faculty and faculty leaders through the Center for Teaching Excellence to unpack some of these issues around classroom instruction, not what is taught in the classroom per se, but to illustrate using ideas that faculty who are engaged in this work can equip faculty how to have those crucial conversations, because faculty are content experts, we greatly respect that faculty, the domain of the classroom is the faculty member’s. There are, on occasion, when questions arise that faculty are not prepared to deal with, we don’t want faculty to be in the position where they’re put in that position, so sharing practices that work and continue to work with faculty, and really equipping them with knowledge and skills to navigate a landscape that continues to be on occasion charged and controversial. MH: Yeah, one of the things that I talked with Lee Bird about during her podcast was there was an event that happened at her institution and she talked about how there was this really heated discussion that took place between two groups of students and there was a faculty member there, the advisor, and the advisor didn’t do anything. And I said, suddenly, I wonder if I were the person, the adult in the room, and all of a sudden I looked around and I realized “Oh my gosh, I’m the adult in the room. What am I supposed to do?” That’s where she had some really practical advice and solutions about, here are some things you can do, and she brought up the same point which is that faculty are experts in their disciplines, but they’re not necessarily taught specifically how to navigate these types of situations in the classroom. DK: No, that’s certainly the case. I know even when I started teaching, because I was an expert in cultural historical geography, they assume that could teach, and so most faculty, I’m certain, we’re not formally prepared to teach and engage in different pedagogies. I think this ongoing professional development for faculty is important, because it enables them to become certainly better at the craft and navigate some of these increasingly polarized issues which will and continue to occur. LW: I think one of the other important things know is that we have conversations about infusing diversity in the classroom, we had conversations about infusing diversity in the co-curricular, which is one of the reasons we had Dr. David Pilgrim here, where he uses images from his “Them” exhibit to teach and to raise awareness about from past issues, all the way up until current day, but instead of being offended by some of those objects, which is a natural thing, how do you have dialogue and discussion where different perspectives are brought to the table, to be able to move forward and to address some of the current things that we’re dealing with. The other part is that in engaging with Dr. Lee Bird, she stressed the importance of relationships, and so how do you force those relationships as a faculty member, as a staff person with students so when those critical times come, it’s easy to have a conversation with them, or it’s easy to minimize the disruption that goes along with diverging opinions which, the difference between fighting words versus hate speech. Becoming aware of those things helps us navigate those critical conversations in more healthy ways, whether we like it or not, those are things that we have to navigate and we have to engage in as well. MH: Right, because we will be offended and acknowledging that things are offensive in a way that you can take it to the next level in the conversation, and get to that next point is a really large part of what I took away from this. So, Provost Kruger, when you sat down with Dr. Edwards, the Vice Provost for Faculty Affairs, and said “Okay, Sue, Leroy, y’all think about what you’re going to do and how you’re going to do this,” what was the goal that you had in mind in creating these series of events, and as you talked about programming them, what did you have in mind? DK: Well, as I sort of mentioned at the tail end of my last response, I think providing an opportunity for knowledge, skills, and disposition when it comes to navigating issues around free speech and the first amendment, the genesis for this when I chatted with Leroy and Sue Edwards and Wooly Fleming as well, was that Dr. David Pilgrim had actually led an initiative around a curriculum audit around his institution and so one of the things we really wanted to do, at least from my vantage point as Provost, is I wanted to engage in that conversation, but when you engage in that conversation, again, the curriculum belongs to faculty, and we don’t want to make any assumptions of what our curriculum looks like but I think when we’ve had the discussions and conversations that we had last week, I think in many regards that lays the ground work for us to build on other things, and later on we’re going to chat a little bit more explicitly about maybe what would come next or how we will continue this work. So, from my vantage point I think really delving into the curriculum piece because if we truly want a diverse, inclusive, and excellent campus, then I we have to look at all facets. We have to look at how we recruit faculty, we have to look at what are we doing to retain faculty and students at the institution from historically under represented populations, but we also have to look at the curriculum and, again, what we’re teaching. Not supposing that we’re doing anything wrong with it, or that we need to make ground in any areas, but just to simply allow thoughtful, well educated individuals look at the curriculum and say well, in this area I think we’re doing exceptionally well, use those examples working with faculty to further that conversation in other areas where we may be doing less well, and continuously improve; that’s what we’re about as an institution, not only from an accreditation perspective, but as individuals we want to continuously improve and I think equipping faculty and others to be able to do that effectively, and more effectively moving forward. LW: I think another component of the birth of the speech summit started at a Provost forum where students were engaged with faculty, and asking the question of, “You’re the experts, so if your life work was around first amendment, or if your life work was around free speech, then what are you giving us? How are you giving us tools to have this information, or this awareness around how to better understand some of these critical topics?” and I think from that perspective, collectively, Sue Edwards, and myself, and Academic Affairs and Student Development, we wanted to take something to the students, and not wait for the students to ask us about what are we doing in response to the chalking policy, or what are we doing in response to first amendment, or what are we doing in response to policy development, and so we responded to that by saying, “Let’s share what we can do to address this particular topic and have ongoing conversations around it.” And I think it started with that idea of, how do we educate our students, faculty, and staff about what free speech is, about what the first amendment is, and what we learned in that is that everyone has their own perspective or interpretation of that as well. So we thought it was very important to bring the experts again to Appalachian and also to utilize our faculty and their life’s work in presenting and writing about, and their dissertations around first amendment and free speech. I think one of the things that was one of the big highlights was to have our panel of faculty who are well-versed in this particular topic who are teaching these things every day who understand the constitution, they were able to navigate with a large audience about what does this really mean from fighting words to hate speech to first amendment? What’s protected and what’s not protected as a part of that? So we responded to that, and we brought Dr. Lee Bird, who is one of the foremost experts, and who’s written the first amendment on college campuses, and how do you navigate the preacher on campus, how do you navigate student activism, how do you deal with the confederate flag when it’s on display, so I think it’s important for our students to understand what are those strategies to navigate those things, and also for staff and faculty, how do we engage our students when its posed as a disruption or as a concern, or what does it mean when you have the feeling of having a fear instilled in you based on what someone has written on the sidewalk, or what someone has distributed or is handing out on Sanford Mall. So, I think it’s important for our students to know that these things may be happening in the interim of you being at Appalachian for two or four years, or five years, but you have to navigate these things outside of Appalachian, so I think it’s a part of your education and your awareness to be able to understand, first of all, what are you constitutional rights, second of all, what does first amendment and free speech mean, and then how do you take all of that information and you go exercise your right as a citizen to vote, or to use your constitutional rights as a part of being a citizen in our society. MH: Right, that was one thing that really struck me, which leads to our next question which is, what did we all get out of this, because I know we all attended these events, but while in a way I’m hearing you say this was an answer to students coming to the administration saying “What are you going to do?” A lot of the discussion was, what are we going to do together? So, instead of “well, this is your responsibility and this is your responsibility,” a lot of the discussion seemed to me seemed like it was around what’s our collective responsibility? And when I’m in a particular situation, situation A, I might have a different responsibility than if I’m in situation B, and that may change depending on whether I’m a student or a faculty member or a staff member, or it may not. It may just change depending on what the situation is and where I sit in that particular environment. So, can you talk a little bit about what you took away? I know for you, Vice Chancellor Wright, some of these folks who visited you had connections with, professional and personal connections with, and so that allowed them to come to our campus. I was joking with Dr. Bird about how when you come to our campus, we take advantage of every moment that you are here on our campus, and I think we did with all of our guests. So can you talk a little bit about what you got out of it and what you feel like students got out of it, and then we can all talk about that a little bit as well. LW: I think in response to having Dr. Bird, and having Dr. Pilgrim on campus, we all have professional ties, we all have professional relationships with people across the country, they jokingly said to me, “this is the family discount to bring us to Appalachian.” I think it’s important to note that having those professional and collegial relationships go a long way, because I get to engage with them in their professional spaces, but it was well received by both of them coming to campus and of course the Appalachian version of rolling out the red carpet and being hospitable and welcoming was just amazingly received by both of those speakers, as well as others who participated throughout the week. I think some of the biggest take-aways for me is that this is not the last conversation, I think this is a building component to having more conversations around free speech and hate speech and how do we respond to that based on our institutional values and who we are as a community, but again, in creating those opportunities for students, faculty, and staff, to engage in critical conversations around topics that are impacting them personally and professionally, but how do we more forward and how do we open the dialogue again about what’s important and come up with solutions and ways to move forward and making sure that we’re representing what it means to be an Appalachian community member, and that doesn’t mean we’re going to not listen to other people or that we’re not going to have conversations, but also we’re going to make sure that we’re being responsive to those who have different perspectives. We may not like it, we may not be okay with it, but that’s why were in a place of higher education, that’s why it’s okay to have a variety of perspectives. It’s diversity and thought, its diversity and perspective, but it’s how you use, understand and give those spaces for people to be heard and we haven’t done a great job at that from a student development perspective, so I think that this is just another way for us to have sustained dialogue as a part of our university, and a lot of people may not be as aware of it, but we have a lot of faculty, staff, and students who have been trained to be facilitators around critical topics. So, we’re not utilizing our resource to the best of our ability, but there’s more opportunity to do that. The speech summit is also an opportunity for us to educate around Constitution Day in September, where we educate as a part of our federal programming where we have to educate or do programmatic kinds of things related to the Constitution, and so that leads to that, and I think in the Spring and over the course of this coming academic year, what is the critical topic that we are going to have to bring in the experts, or we’re going to have to address to make more meaning for our students as Mountaineers, or our campus as a community as a whole, and not always be quick to generate policy when there’s issues. I mean, but we can have conversations, or community dialogue, or bring in all players to make sure that we’re managing that in the best way. MH: Yeah, and Provost Kruger, I think Vice Chancellor Wright just took us into our next question as well, so not only what did we learn from this event, and one of the things that I ended up talking with Dr. Love about is, you know, sometimes it’s really easy for people to just pull a short sound bite and really focus on a very small snippet really of a conversation, and what she really helped bring out was that a lot times it’s that really, kind of, squishy gray area where the real learning takes place because you start delving into the nuances of conversations, and that’s where having these conversation in the classroom is really critical, and the work that our faculty are doing around developing those critical thinking skills in our students is really important. So can you talk a little bit about what you learned from the event, and what you also think were big take-aways for faculty. DK: I think one of the things we learned from the event, is a sense of affirmation. There are a number of things that we are doing around these topics, that sometimes when you’re sort of in the trenches, you seldom get time to reflect on what you’re doing, well often times you hear what you’re not doing well because people are telling you what you’re not doing well, so I think that sense of affirmation, but not complacency. So I think there’s a couple of things that we are doing well, and I mean I think just creating this space for this conversation Leroy mentioned earlier, he was at his national meeting and I was at the American Council on Education meeting about a fortnight ago, and as we listened to many of the sessions at least at the American Council on Education meeting, we were able to hear what other institutions are doing, and were able to say, “Well, yeah, we’re doing well in that area, and maybe we can make headway in other areas.” So I think that affirmation was certainly one component. Second takeaway, and I think Lee Bird hit this pretty heavily that I had the privilege to be a part of is that on a college campus in the 21st century, we can’t separate ourselves. We can’t create these silos that if you don’t agree with someone, you don’t speak to them. She was very explicit with that, and when she says it of course, you listen to it and you say, “Well that makes sense,” but sometimes very obvious things we need to hear. So, she spoke a lot about safe space, and we do have safe spaces on campus, which we should have, and I spend as much time as I can in those safe spaces like the Multi-Cultural Center and the Veterans Center because I think those spaces create a context and an environment where a sense of community can be built. But, I think what Lee Bird also emphasized is that the entire campus cannot be a safe space, because once we educate students and they go out into the world, when they’re in the work place, at college you’ve got to develop the ability to be tolerant and you have go to be resilient, and if you are nested or buttressed within a safe space all the time, you’re not going to have the ability to stretch yourself, Vygotsky, the Russian development student spoke about zone of proximal development, and if you’re not stretched, you don’t grow and become resilient, so I think that was another take-away for me and I think we can build on many of these lessons that we learned and try and make some headway in other areas. MH: I’m glad you said that about the affirmation, because I did hear all of our speakers say that at one point in time, a couple of them said it on air, it is important to recognize where we are operating from a position of strength, because you’re right, we work a lot on getting better at things and identifying things that we don’t do well, and I think that’s part of being in higher education, because we want to continually improve, and certainly we want our students to develop that type of thought process so that when they go into the work force they are in a continual improvement mode as well, or wherever they go next. But, it is every so often nice to hear someone from the outside say, “Okay there are a lot of things you could do differently, but you’re doing a lot right.” And it is nice when we work really hard to try to somethings right for someone to say that every so often. So Vice Chancellor Wright, can you talk just a little bit about how you see this work continuing beyond the event. LW: I think that’s a great question, Megan. For me it’s how do we continue to have, we talk about safe spaces, but spaces in general for our students to continue conversations about what’s important to them, because I think a lot of conversations about micro-aggressions and trigger warnings and you know, what does all of that mean for our students who exercise their voices, or who are demonstrating some level of student activism. For the record, student activism is okay. Student activism, and having perspectives and opinions is okay, but it’s how you embrace the opportunity to have dialogue and healthy conversation. Dr. Lee Bird shared a couple different resources, like “Bring it to the Table”--what does it mean to bring that issue, or that concern, or that topic to the table where we can have a conversation about what’s important for you, and how does that impact the Appalachian experience, or how does that impact you as a Mountaineer. She also referenced a book called “Free for Me, not for Thee”, so it’s sometimes okay to exercise our free speech, but it’s not okay for us listen to other people’s perspectives, and so I think ongoing in the future is to create those opportunities where we have the opportunity to have dialogue, bring student perspectives to the table, bring our faculty experts, or our staff members who can contribute to that, and come up with some tangible directions or solutions or maybe we’re not looking for solutions, and just an opportunity to be heard, and to say how things are impacting you or how it makes you feel, but you also have to have a sense of resiliency and get back to the priorities and what’s important. You can’t stay in the space of the sense of fear that someone may have instilled in you based on what they said, but you still have to go to class, you still have to prepare yourself for navigating these critical kinds of things outside of Appalachian. So, I always tell students, I didn’t do what I was supposed to do if I didn’t give you the strategies and the skills for you to navigate this landscape that you’re going to have to navigate outside of the walls of Appalachian, and so some people interpret that as “Oh you coddle students too much,” it’s not about coddling, it’s about giving students an opportunity to learn how to use their voice in ways that’s going to either impact or make a difference, or bring about change. I think it about helping them grow and learn to find out who they are and what’s important to them, and also to understand that what may be important to you, may not be important to the next person, and that’s okay. So I think for me, how do we move forward and bringing these critical topics to the forefront, or how as administration, or as Vice Chancellor, or as Provost, how do we make sure we’re being responsible before we have to manage a reactive space. So, I’m always open to being more proactive if there are current issues or current things going on, how do we get in front of that versus getting behind that when a student is wanting to raise their voice or have a list of demands. So, sometime that’s become a part of the response or the reactive stance is to write a letter, and in that letter it includes a list of demands for whatever that change is, or whatever that issue is, but how do we develop those important relationships with students, how do we put ourselves in those spaces where we can listen every day to students and navigate that in ways where when that time comes for us to be reactive, it is an easier conversation, it’s not a reactive conversation based on whatever that critical topic is. So as we move forward, looking for ways to be proactive, looking for ways to continue raising awareness and educating our students about how to better use their voice or how to be a part of the solution or how to come to the table and navigate these things in very diplomatic, democratic kinds of ways. MH: So, Provost Kruger, this is podcast with the Provost, so last word goes to you. How will we continue the work that our campus community began? DK: Certainly, thank you Megan and Leroy for this opportunity it has been enjoyable, and I continue to enjoy the partnership with Student Development. I didn’t intend to start there, but since I did I’ll pick up with that. I think one way that we can continue this work with a strong partnership with Student Development and Academic Affairs. Leroy and I connected probably within a month or two after he arrived on campus before many of these issues arose, Leroy and I were meeting monthly and more frequently if we needed to, and I think that friendship that we developed and the joint approach to basically working for the good of our students I think it something that continues, and it’s not about Leroy and myself, I think we provide that leadership, and that certainly is throughout the divisions. The partnership I think with Wooly Fleming as Chief Diversity Officer is critically important as well, so I think we’ll be effective in continuing this work if we work in unison and we don’t work in out isolated pockets. I think that’s critically important. Secondly, we have incredibly talented faculty. We have 1200 faculty in total, that’s tenure, tenure track, as well as non-tenure track faculty, and we do have significant pockets of expertise in these areas, and I think the way you continue to bring about change is you model and demonstrate what is being done well rather than telling people what they’re doing wrong, and I think if you approach it in that spirit of, again I’m sounding like, I’m dating myself, like a broken record, I think if you approach it in that way and Sue Edwards working with people like faculty, like Brandy Bryson, who participated in these conversations together with many, many other faculty I think providing those ongoing professional development opportunities for our faculty working from a position of what people are doing well to being with I think is critically important. And then I think a third component that I’ve been an advocate of since I arrived at the institution, that actually dates before I got to the institution and it comes from role models like Nelson Mandela in particular, is when people disagree, you have to engage. Building up walls, isolating yourself does not work, and so we in the context of student protests, we need to engage with students and I think we’re doing a very, very good job at that. Does it mean we’re doing everything right? No. But I think the model that we’re currently using around work groups, the Docker working group is a case in point, that Sue Edwards is cherrying together with faculty and student representatives on that group. That’s the way to Leroy’s point if people feel strongly, if students of faculty feel strongly about an issue, you surely can write a resolution, I think a more effective way to engage with leadership, not in a hierarchical fashion, but in being partners at the table, because in that engagement you can find common ground to move issues forward that are important to all of us and we can indicate places where we can’t move in a way that maybe students would want us to move, and explain and share the reasons why that’s the case. I’m a great lover of biography, and others have heard this in other contexts, but I think Meacham’s biography of Thomas Jefferson, Thomas Jefferson had it right when he realized that all that people wanted to be was that they wanted to be heard, and that doesn’t mean you listen to people and you send them away, but this piece of engagement that I’m speaking to, we have to continue to do that to move forward if we’re going to have a campus climate that is inclusive and respectful and we can disagree, but how we disagree is critically important. We have to engage, we cannot isolate ourselves from each other. MH: Well, Provost Darryl Kruger, Vice Chancellor Leroy Wright, thank you very much for your time today. Information about what took place is available at diversity.appstate.edu/saywhat, where you can also find podcasts with several of the event speakers, so if you happened to miss one or two, check out the podcasts. The discussions were rich, and thoughtful, the speakers were very engaging and since it sounds like we may continue with programming like this, you can get a taste of what you might get to experience in person next time. So, that’s it for the Podcast with the Provost. Thanks for listening! Through a weeklong series of conversations, panel discussions, speeches and forums with experts in the field, our community will explore the questions of balance between respect for and obligation to the First Amendment and an institutional culture of respect for thought, belief and community.